Many users consider tablets entertainment electronics. This Amazon Fire HD 10 tablet review is about a highly entertaining tablet from Amazon. You can also see this Amazon Fire and Fire HD comparison to gain a better insight. Inside the Fire has a QuadCore SoC by Mediatek, which achieves a good middle-level performance. The camera equipment is relatively basic. The rear camera takes pictures with a resolution of 5 megapixels and the front camera – at 2MP. 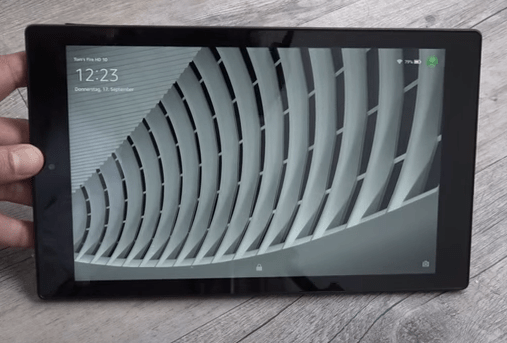 This tablets operates on its own Android development – Fire OS. The latest version is 5 “Bellini”, based on Android 5.0 “Lollipop”. The device is intended mainly for the consumption of media – the home screen takes you right to Amazon’s product world. The pre-installed apps cover the bare necessities. You can download additional apps from Amazon’s app store, which has ~400,000 applications. I have Amazon Prime and I believe that Amazon Kindle Fire 10 is ideally suited for the Prime customers – it allows them to enjoy Amazon’s immense video platform. For such users, it is the perfect companion. The display resolution is sufficient to watch movies in great colors. Some reviews indicate that the resolution is not on par with iPad. Yes, but the iPad costs more than double and is an all-rounder rather than just a multimedia consumption device. Amazon often tries to sell the devices they manufacture at cost or even a bit lower, to bridge the user who will hopefully start buying Amazon content via the device – books, video, audio etc. I watch films on the FireHD almost exclusively, and have no issues with the resolution. Yes, the iPad delivers more detailed images, but that doesn’t matter when I look at the display from a distance. Advertising appears only in the locked state, so no problem. I am less enthusiastic about the download speed onto the memory card. An episode lasting about 40 minutes at 720 p downloads in approximately 10 minutes onto the internal memory. On SDcards it takes forever. I’ve tested several cards, whether class 10 or class 4, it still takes forever. I now always download overnight. The battery lasts about 9 hours of movies. Short charging time – only 3 hours from 0 to 100% (2 amp charge rate). The WiFi worked right off the bat. The only real negative for me is inability to use a SIM card, which is why I am continuing to use my iPad for travel. Another small drawback is that there is no Google Play Store available, only Amazon app store. Even though you get many apps and games, I miss eBay Classifieds. Operating system is extremely stable even when the “strenuous” use by children. The possibility of storage expansion is another plus. Easy to set up, everything easy, runs really smoothly. To conclude my Fire HD 10 Tablet Review: this tablet fully meets my expectations is perfect for home use, to watch videos, to quickly Google something, a little bit to playing or to read online news. Very good price performance ratio, good toy. I’m really happy with the product. What do you think about the Fire HD 10? eBook Subscription Services – a Quiet Revolution?